Yet another great Soho local that has been preserved for the good of all of London! 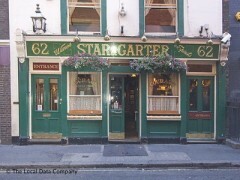 About: Star & Garter is a traditional pub serving a variety of wines, beers and spirits. They also serve sandwiches and snacks at lunch times. Trying to make it into the film business? Then you could do worse than heading to The Star and Garter in the evening. Dominated by postproduction workers, it has a good atmosphere and will let you spill onto the street with pint in hand – always a bonus. It only serves a generic selection of beers but still, a cosy little pub that won’t let you down. "Yet another great Soho local that has been preserved for the good of all of London! " The Star and Garter is a quiet local in the heart of Soho with a village pub appeal. Sure, it may have slews of media types coming and going between 5pm and 10pm from Wednesday night onwards but once you’re inside and in reach of an intimate corner, you’re golden. Peroni on draught; that might just be the only thing that particularly stands out about the Star and Garter on Poland Street, but that seems to be the way it wants it to be. There’s none of that fancy Sky TV here (although they do show football aired on terrestrial channels) and no frills about the décor, which is as classic as they come in London. Some might describe this as ‘an old man’s pub’ but since the only ‘old men’ in sight on a busy Thursday night are hip Soho post-production types, we’ll have to adjust that somewhat. The Star and Garter is a conversation facilitator; it keeps the music and extras to the bare minimum to put the punters in charge of creating the atmosphere. Some might find that a rather lackadaisical approach, but there are many who enjoy the simplicity of a pub experience like this. The Star and Garter is another of Soho’s great locals and at just a hundred yards from Bodean’s, you’ve got the perfect place to eat once you’re ready to swap the local of the past for the BBQ pork of the present. Sometimes it seems like every other pub in the West End is a Sam Smith's, which can make avoiding the ordeal of sinking a taddy lager a bit difficult. So, in that sense, The Star and Garter is a saviour. An unashamed media pub for the Soho post production crews. Never has a simple pint of Stella tasted so sweet. And it's a cozy place to park up on a cold evening.